This October was the month of events at Chonnam National University (CNU). Starting with the Yongbong Annual Festival, many events such as CNU International Day, Oktoberfest and Information Session with European Exchange Students took place on campus. These cultural events gave students the opportunity to experience diverse cultures. They need, however, some improvements to be events that everyone can enjoy, learn and help to understand different cultures. 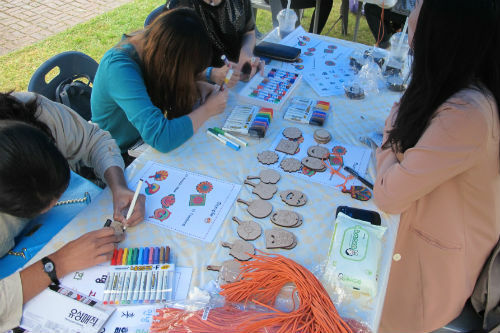 CNU International festival took place around Bongji on October 10th and many foreign students at CNU got together and experienced various cultures. According to the Office of International Affairs (OIA), the festival starting from 2010 has improved in terms of content and the scale year after year. In the festival, participants can play Korean traditional games such as Yutnori (board game) and Tuho (arrow-throwing game), making traditional masks, fans, dancheong (multicolored paintworks) on wooden buildings, and wooden necklaces. They also enjoyed a variety of cuisines from different countries which is the main theme of the festival. In 2013, 20 teams from 14 nations took part in the food booth. Although the number of participants was less than the last festival because of the bad weather, it was estimated about 500 foreign students participated in the event, according to the number of respondents of a survey by the OIA. However, there was not much information about the festival. The promotion was only on the homepage and facebook of the OIA was not enough to let people know about the festival. Satsuki Nagata (Japanese Exchange Student, Saga University), one of the students who took charge in the Japanese booth, said that there were only few chances to explain about the food since lots of students came by. “We prepared small signs about how to make Japanese foods such as Okonomiyaki and Chocolate Banana and where they are famous but they were so small that many people could have easily missed out.” She added that most students who came to the festival stopped by accident. The person in charge of the event from the OIA answered that they are mapping out the menu of the countries showing the name and explanation of the foods for the participants for the next year. In addition, the advertising and promotion will increase. Oktoberfest was held on October 11th, in commemoration of 130th anniversary of the establishment of diplomatic relations between Germany and Korea and 30th anniversary of festival of Department of German Language and Literature. The biggest festival in Germany, Oktoberfest, meaning ‘Festival of October’ in German, is held every year for two weeks from the third Saturday in September to the first Sunday in October in Munich. On CNU campus, about 500 people enjoyed various events such as an exhibition about German cities and Oktoberfest, drinking beer and sausage in front of the Humanities Buildings. Students obtained information about student exchange programs with Germany. There were also a play performance, Physicists (Die Physiker) in Humanities 3 and a concert of German Blaserquintett in Yehang Hall as a part of the 2013 October Music Festival. Even though the programs were various, most participants said drinking beer and eating sausage made a deep impression to them. ”Since lots of people gathered around the beer booth, the seats were lacking,” said Park Jong-dae (Junior, Dept. of German Lang. & Lit.). The department pointed out that a connection between those programs was absent owing to the lack of promotion. “We are planning to make more cultural programs for the next festival, especially with Goethe-Institute in Gwangju planning to open in December at CNU,” said Song Kyung-an, the dean of the Department of German Language and Literature. On October 16th, the Information Session with European exchange students was opened for the first time. The presentations of 15 students from England, France, Czech Republic, Germany, Poland and Croatia about European university life made CNUians interested in Europe and lasted for about one and a half hours. Pavel Wodo Hanus (Czech Exchange Student, Czech University of Life Sciences) who suggested the idea of this session to the OIA said, “I heard Korean students are shy to speak in English with foreigners. But, with no formal atmosphere this helped to make them comfortable to speak face to face.” He added there was not much time for discussing with students. Like this session held for the first time, more programs will be formed in the name of cultural exchange. Then, what can we do to make better cultural exchange programs? It is the question depending on everyone. First, the better quality of the events is needed before blindly advertising to more students. Also, students need to participate actively in various events. After all, ‘great’ vessels make the most sound.